Hells Canyon is the deepest river gorge in America, deeper than the Grand Canyon. The state of Idaho is located within the Rocky Mountain region in the United States, and it documented to be the 14th ranked most expansive state and the 39th ranked most populated state in the country with a population of over 1.2 million. The state capital is Boise and is also the highest populated city within the state. 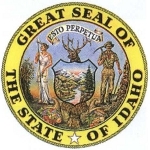 Idaho was admitted to the Union as an official state on July 3rd, 1890 and it was the 43rd state to be accepted into the United States. Idaho is a relatively large state as compared to the other states in the U.S. And actually has a land area bigger than all of New England combined, with roughly 83,500 square miles of land. 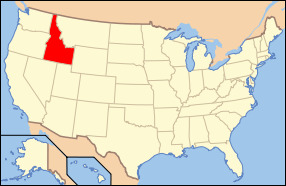 The state has a mountainous geographic landscape and is completely landlocked by Washington, Oregon, Nevada, Wyoming, Utah, Montana, as well as the British Columbia. The city of Lewiston inside of Idaho is actually the farthest inland seaport on the entire pacific coast due to the large network of dams and lock systems constructed on the Columbia River and Snake River. Idaho has the nickname the “Gem State” simply because almost every type of gemstone has at one time or another been discovered in the state. Another popular name for the state is the “Potato State” due to the large volume of potatoes grown there because of the ideal climate in the region. The highest point of elevation in the state is Borah Peak which peaks out at 12,662 feet above sea level, while the lowest point in the state is located at the Snake River in Lewiston which is measured at only 770 above sea level. The state bird in Idaho is the Mountain Bluebird while the state fish is the Cutthroat Trout. The state flower is the Syringa and the state tree is the Western White Pine tree. The state gem is known as the Idaho Star Garnet, which is a Garnet with a four or six rayed asterism. Idaho's main industry is centered around agriculture, particularly potatoes, sugar beets, barley, wheat, mining, and lumber. Idaho is overall a very peaceful and relaxing state with a large agricultural core that helps support the United States overall agriculture system.